Arseny Tarkovsky in the mid 1930s. Arseny Alexandrovich Tarkovsky (Russian: Арсе́ний Алекса́ндрович Тарко́вский, June 25 [O.S. 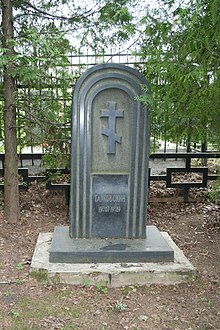 June 12] 1907 in Elisavetgrad – May 27, 1989 in Moscow) was a prominent Soviet poet and translator. He is considered one of the great twentieth century Russian poets. He was predeceased by his son, film director Andrei Tarkovsky. Tarkovsky was born on June 25 N.S. 1907 in Elisavetgrad, Kherson Governorate, Russian Empire (now Kropyvnytskyi, Ukraine). 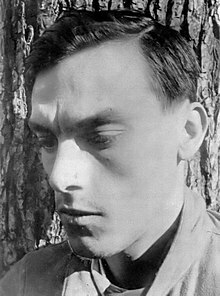 His father, Aleksandr Tarkovsky (in Polish: Alexander Tarkowski), was a bank clerk, Russian revolutionary (Narodnik), and amateur actor of Polish origin and his mother was Maria Danilovna Rachkovskaya. In 1921, Tarkovsky and his friends published a poem which contained an acrostic about Lenin. They were arrested, and sent to Nikolayev for execution. Tarkovsky was the only one that managed to escape. By 1924 Tarkovsky moved to Moscow, and from 1924–1925 he worked for a newspaper for railroad workers called "Gudok", where he managed an editorial section written in verse. In 1925–1929 he studied literature at a university college in Moscow. At that time he translated poetry from Turkmen, Georgian, Armenian and Arabic. During World War II he volunteered as a war-correspondent at the Army Newspaper Boevaya Trevoga (War Alarm). He was wounded in action in 1943. The leg wound he received caused gaseous gangrene, and Tarkovsky had to undergo six gradual amputations. Arseny Tarkovsky was mainly known as a translator of Abu'l-Ala-Al-Ma'arri, Nizami, Magtymguly, Kemine, Sayat-Nova, Vazha-Pshavela, Adam Mickiewicz, Mollanepes, Grigol Orbeliani and many other poets. His first collection of poetry, Before snow, was published in 1962. He lived mostly in Moscow and Peredelkino and died on May 27, 1989 in Moscow. In 1989 he was posthumously awarded the USSR State Prize. Благословенный Свет – The Blessed Light (1993 -posthumously). ^ Безелянский, Юрий (June 19, 2007). "Наследник Cеребрянного века". Moskovskaia pravda (in Russian). 130. ^ a b c d Korolev, Anatolii (July 16, 2007). "Fate of father became life for son". Molodezh' Estonii. 162. (in English)  A selection of three poems in English translation in Harvard Review: "Housewarming," "Dreams," and "The Azov Steppe". This page was last edited on 25 December 2018, at 10:38 (UTC).